The foot has three arches: two longitudinal (medial and lateral) arches and one anterior transverse arch (Fig. 1). They are formed by the tarsal and metatarsal bones, and supported by ligaments and tendons in the foot. Their shape allows them to act in the same way as a spring, bearing the weight of the body and absorbing the shock produced during locomotion. The flexibility conferred to the foot by these arches facilitates functions such as walking and running. In this article, we examine the anatomy of the arches of the foot – their bony and ligamentous structure, the supporting tendons, and their clinical correlations. Fig 1 – The longitudinal and transverse arches of the foot. There are two longitudinal arches in the foot – the medial and lateral arches. They are formed between the tarsal bones and the proximal end of the metatarsals. Ligamentous support: Plantar ligaments (in particular the long plantar, short plantar and plantar calcaneonavicular ligaments), medial ligament of the ankle joint. Bony support: Shape of the bones of the arch. 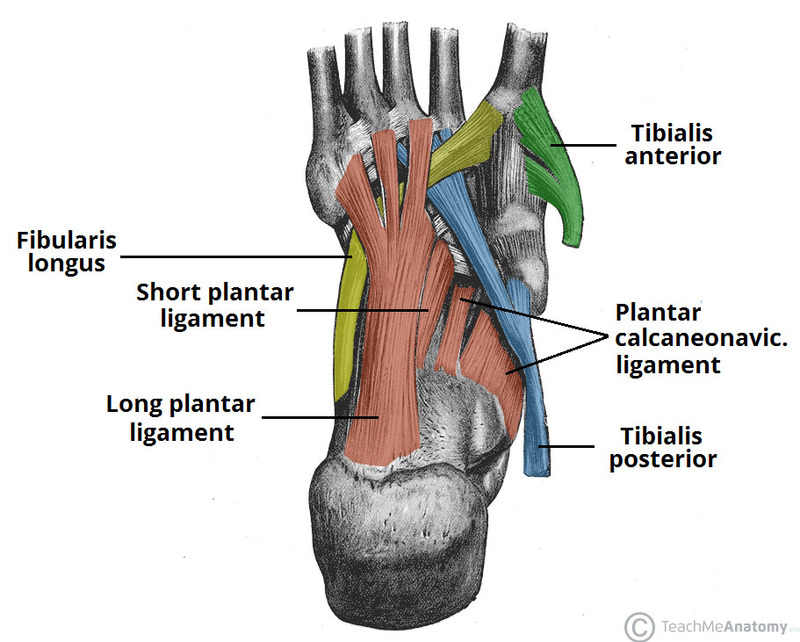 Muscular support: Fibularis longus, flexor digitorum longus, and the intrinsic foot muscles. Ligamentous support: Plantar ligaments (in particular the long plantar, short plantar and plantar calcaneonavicular ligaments). Fig 2 – Supporting structures of the foot arches. Muscular support: Fibularis longus and tibialis posterior. Ligamentous support: Plantar ligaments (in particular the long plantar, short plantar and plantar calcaneonavicular ligaments) and deep transverse metatarsal ligaments. Bony support: The wedged shape of the bones of the arch. 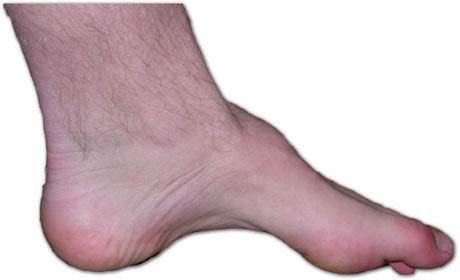 Pes cavus is a foot condition characterised by an unusually high medial longitudinal arch. It can appear in early life and become symptomatic with increasing age. Due to the higher arch, the ability to shock absorb during walking is diminished and an increased degree of stress is placed on the ball and heel of the foot. Consequently, symptoms will generally include pain in the foot, which can radiate to the ankle, leg, thigh and hip. This pain is transmitted up the lower limb from the foot due to the unusually high stress placed on the hindfoot during the heel strike of the gait cycle. Causes of pes cavus can be idiopathic, hereditary, due to an underlying congenital foot problem such as club foot, or secondary to neuromuscular damage such as in poliomyelitis. The condition is generally managed by supporting the foot through the use of special shoes or sole cushioning inserts. Reducing the amount of weight the foot has to bear, via overall weight loss can also improve the symptoms. Fig 3 – Pes cavus, an abnormally high longitudinal arch. Fig 4 – Pes planus, an abnormally flattened longitudinal arch. Because the arches are formed, in part, by the tight tendons of the foot, damage to these tissues through direct injury or trauma can cause pes planus. However in some people, the arches never formed during development. For most individuals, being flat-footed causes few, if any, symptoms. In children it may result in foot and ankle pain, whilst in adults the feet may ache after prolonged activity. Pes cavus of the foot describes which abnormality? The longitudinal arches of the foot span between which two structures? Which of the following structures are not involved in the medial longitudinal arch?